We all have some explaining to do, because in the Warner Bros. movie, Storks, they don’t deliver babies – they deliver packages. We all know that Storks deliver babies. I mean, come on, that's what our parents told us. And that's what we tell our children. But wait, we will all have some explaining to do, because in the Warner Bros. movie, Storks, they don't deliver babies – they deliver packages. Yes, you read it correctly. Packages. You see, Storks did deliver babies up to about 18 years before the film starts. But when one incompetent employee Stork loses an address to deliver a baby, the Storks have to find something else to do, besides raise the child they can't deliver. Opening up Cornerstone, the Storks now deliver packages that are anything and everything but babies. Orphan Tulip (Katie Crown; Bob's Burgers), as the Storks call her, really tries to help in the factory, but it's clear that she doesn't fit in. Meanwhile, a lonely little boy named Nate (Anton Starkman), whose parents are Henry (Ty Burrell; Finding Dory) and Sarah (Jennifer Aniston; Office Christmas Party) comes across an old brochure about Cornerstone and their former business of baby-making. Nate writes a letter to Cornerstone asking for a younger brother with Ninja powers. The letter, received by Cornerstone, lands in the hands of Tulip, who has been banished to a defunct area of the company, and instead of destroying it like she should, she ends up processing the letter and creating a baby, which now needs to be delivered before anyone finds out what happened. With the help of her Junior (Andy Samberg), Cornerstone's top Stork Delivery bird, Tulip is determined to deliver the baby to the little boy, Nate (Anton Starkman), who, unbeknownst to him, is going to be on the receiving end of a little sister. Adventures abound as Junior and Tulip meet dangerous wolves and even the retired Stork, Jasper (Danny Trejo; Desperado), who lost Tulip's address 18 years before, causing her to become an orphan. Even conspiracies within the company, plotted by Toady (Stephen Kramer Glickman; Cupcake Wars) are present. Despite trials and tribulations, happy endings happen for all in this light-hearted animation by Warner Brothers. Warner Bros. released this version in 4k Ultra HD, 2160p and an aspect ratio of 2.4:1. You have to actually watch the 1080p Blu-ray for an explanation into what differentiates 4K UHD, but it's actually well worth listening to it. They describe the 4K UHD as "brilliant brights, and deeper darks… dazzling colors." I can't disagree. The colors pop, which is so important in an animated film. And if you don't have 4K, don't worry- the 1080p version is bright and colorful as well as worth watching. Both versions use DTS-HD audio. The music crescendos nicely and the dialogue can be heard over the background music and noises. I didn't hear any lag in the audio. In addition, the music was well placed and supported the storyline appropriately. Commentary: Always my favorite, you can watch the movie without the loud sound or music and listen to the Douglas Sweetland, Nicholas Stoller, John Venson, and Matt Flynn provide you with their perspective of what happens in the movie and why. The Master: A LEGO Ninjago Short: Warner Animation Group presents a short animation of Ninjago (LEGO). Overall, Storks is a cute movie to watch. The message and storyline is simple and easily understood by the younger crowd without the adults worrying about having to answer too many questions. 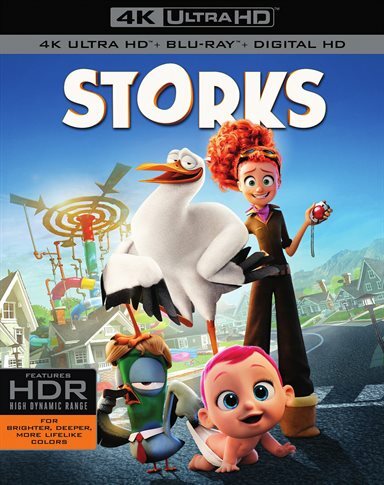 Download Storks from the iTunes Store in Digial HD. For more information about Storks visit the FlickDirect Movie Database.